Welcome to the Crystal Coast! 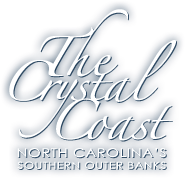 For information on Emerald Isle and the Crystal Coast area check out our Crystal Coast Visiting Center and Emerald Isle's webpage to see all the Things to Do in the area. From Golf to Historic Sight Seeing, Relaxing on the Beach or a Family Trip to the Aquarium, the Crystal Coast has plenty to keep you busy. Go to Emerald Isle Webpage and get the Latest News so you keep informed of all the island happenings year round. You can keep your agenda full with exciting activities; like the Shackelford Banks, Bird Shoal, Cape Lookout, Lady Swan Boat Tours, and so much more. Important information such as Beach Regulations and Tide Tables can also be found on the Town of Emerald Isle webpage and the webpage for Tide Tables. Here you can find local regulations on beach vehicles, water access points, and beach safety.